MILES MCENERY GALLERY presents an exhibition of new works by MARKUS LINNENBRINK for his fourth solo show with the gallery. The exhibition is on view at 525 West 22nd Street. It is accompanied by a fully illustrated publication, featuring an essay by Frédéric Caillard. 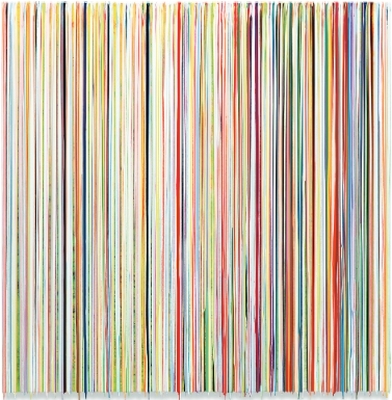 Markus Linnenbrink’s energetic, three-dimensional paintings and sculptures are an experience of time and color. In this series of works, Markus Linnenbrink challenges viewers to contemplate the idea of time in art: how a moment may be captured and sustained within an arrangement of color. For this exhibition, Markus Linnenbrink also presents “DAYLIGHTTEARSTOMYEYES.” Fusing together acrylic, pigment, and sumi ink on wood and aluminum core, Markus Linnenbrink pushes his installation practice further. Black and white on the exterior–and color on the interior, his “room within a room” is an expansive, three-dimensional work that adapts to both the allowances and limitations of its environment. MARKUS LINNENBRINK (b. in Dortmund, Germany in 1961) attended The Gesamthochschule in Kassel and later the Academy of Fine Arts in Berlin. In 2016, Markus Linnenbrink completed two permanent public installations: an outdoor wall-painting at SLS Brickell Hotel and Residences, Miami, FL, and a series of paintings for 75 Rockefeller Plaza, New York, NY.